Dimensions 0.75 by 7.25 by 9 in. Reading (Middle school); United States. Content area reading; United States. Educational Psychology | 50 Instructional Routines to Develop Content Literacy | Content-Area Writing | Doing Critical Literacy | Tools for Teaching Academic Vocabulary | Tools for Teaching Content Literacy | Do I Really Have to Teach Reading? "To help every kid fall in love with at least one field of knowledge, our students must encounter our fields' most galvanizing, tantalizing, and pivotal documents. This book is about making those encounters as compelling as we can make them." We are specialists to the bone-in science, math, social studies, art, music, business, and foreign language. But now, the Common Core and state standards require us to help our students better understand the distinctive texts in our subject areas. "Nobody's making us into reading teachers," write Smokey Daniels and Steve Zemelman, "but we must become teachers of disciplinary thinking through our students' reading." 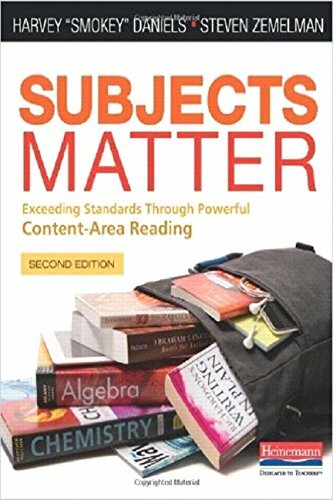 Subjects Matter, Second Edition enables deep, thoughtful learning for your students, while keeping the irreverent, inspiring heart that's made the first edition indispensable. You'll discover fresh and re-energized lessons, completely updated research, and vibrant vignettes from new colleagues and old friends who have as much passion for their subjects as you do. "We'll be using methods particular to our fields as well as engaging reading materials that help students understand and remember our content better," write Smokey and Steve. "We can realize that vision of the light going on in kids' heads and maybe fill them with enthusiasm about the amazing subject matter that we have to offer. Sound good? Let's get to work." About: "To help every kid fall in love with at least one field of knowledge, our students must encounter our fields' most galvanizing, tantalizing, and pivotal documents.